York Place Studios are Dom, Liam, Alex and Matt: a multi-award winning family collective of street-documentary style wedding photographers and videographers who seek to find big stories in even the smallest of moments throughout every single stage of a wedding day. The focus of our wedding photography is on people and personality, seeking to create lasting memories with connection, humour, life and atmosphere, just the way it felt to be there. Real stories, real personality, real memories. Real moments that really matter. You’ll often hear us described as either Reportage or Documentary Wedding Photographers and Videographers. In fact we’ve even been credited as the creators of a whole new alternative genre known as Street Documentary Wedding Photography. 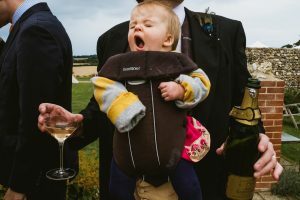 Whilst those terms are certainly fitting to the natural, unposed, un-intrusive way we approach our wedding photography and filming (and you can read more about that approach here), in truth neither of those descriptions are really what we’re about. At the heart of it our style is incredibly simple: It’s about you. Turn up the volume and watch this sixty second slideshow below to see more of the moments we love to capture. You and your personalities are at the centre of everything we do as wedding photographers. We capture every image right there in the moment: carefully composed but completely un-staged. We never look to recreate past photos or retrace our steps from another wedding, we find new, authentic imagery inspired by the people around us. Your wedding memories aren’t just about traditional set pieces and your photographs can be so much more powerful than that. They should celebrate the relationships between your family and friends. They should showcase the spontaneous, unpredictable, beautiful, hilarious, sometimes ridiculous stories that we find around you. Your wedding photographs should be like printouts of your memories. We want to take you right back to the moment they were taken and help you experience once again how it felt to be there. Meaningful memories can never be forced or forged, they come from real moments, from people being themselves. Whether big moments or small, these are the moments that matter. We’re a family team at York Place: husband, wife and two brothers. Family is important to us and perhaps that’s why we view family and friends as the most important part of your wedding. This is the one time that everyone you know from every stage and adventure of your life comes together. Different people, different personalities all bound by one common denominator: their affection for you. Your wedding is an opportunity to really celebrate with those people. A chance to have fun, party like never before and live and love every last second of it. Weddings are a love story but they’re also a story of friendship and of laughter. That’s what we believe wedding photography and videography should be about too! As International Wedding Photographers and videographers as well as Street Photographers and Educators we’re lucky enough to travel across the globe. From our Yorkshire home we’ve travelled as far and wide as Cuba, Tokyo, Sri Lanka, the United States and across the length and breadth of Europe from Poland to France. Wherever we go though it’s people, not places that are at the centre of our world. Our style of photography is discreet, unstaged and playful. Our mission is to create powerful, unique wedding photography without posing throughout every part of your day. So from a simple pub wedding to the most epic destination wedding location, from 20 guests to 1000; every wedding we photograph is completely unique and an absolute honour to be a part of. Put simply, as documentary wedding photographers our main focus is on capturing real, candid moments throughout every part of the wedding day without posing or directing you in any way. The job of a documentary wedding photographer is to move our own feet, not yours to create interesting compositions. That way you can stay in the moment and just relax and enjoy your day without worrying what your photographers are up to! That’s not to say that we won’t take any group shots or portraits if those are important to you. This is your wedding day and we’re there to capture everything you need. Our priority though is to let events unfold without our interference so that your wedding photographs show the real you. To create imagery that showcases the real personalities of your family and friends on the biggest day of your lives. We’ll never stop looking for great stories and opportunities. We know that every single part of your wedding is an important memory. Our philosophy is that every moment throughout the day is just as important as the last.